Cheese and Crackers, Champaign-Urbana’s source for the finest cheese, salami, crackers, cured meats, fresh fish, chocolates, steaks and much more! Stop by today and speak with a professional Cheesemonger or any member of staff about your next holiday party, cheese trays, gift basket and more. This is a working farm. During the height of their production and marketing season (April through November), they are extremely busy making cheese, taking care of the goats, tending the orchard, selling cheese and fruits at farmers’ markets and hosting farm dinners. In 2016, our farm is open for self-guided farm visits and farm product purchasing during the week. We’re a full service, cooperatively owned grocery store, which means we’re owned by members of the community (like you) who buy shares. We’re passionate about naturally delicious, sustainable food—and that’s just the beginning! Anyone can shop here and enjoy all of the services we offer- from our salad bar to our robust education program! The expanded specialty food selection includes imported and domestic artisan cheeses, pastas, sauces, fine wines and much, much more. Harvest Market carries an almost full line of Piemonte Sausage. Harvest Market believes in good food that tastes great … always; providing our customers food choices with integrity and transparency; and connecting our customers and our associates to farmers, food makers and to the land. Hy-Vee is a food lovers delight with bulk and specialty food sections including prepared and fresh foods. There is even a full service restaurant serving craft beers. Satisfy your food cravings anytime — if you are in the Bloomington, IL area. Entering World Harvest is like taking a trip through the Mediterranean. As it’s name implies there are many varieties of cheeses, olives, meats, sweets and spices from around the world. It offers a full range of fresh fruits and vegetables, fresh baked breads and desserts and other natural food products. Looking for a special food item that you can’t find any place else in Champaign-Urbana? Visit this market in the heart of Urbana. 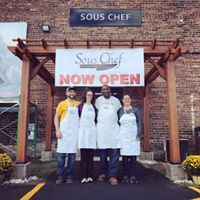 Sous Chef, Peoria, IL, is more than a local grocery store. It offers basic groceries, quality meat such as Piemonte Sausage and Salumi and fresh produce. It is a new grocery in the food desert of Peoria’s warehouse district. This distinctive store also offers Sunday brunch and catering services. Have a unique sausage or salumi requirement? We produce private label sausages using customers’ recipes or can develop a recipe for you.